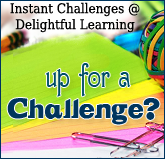 Here is our instant challenge for this week. If you missed it, be sure to see my introductory post for rules and more information! And if you are participating (or planning to!) you can still enter the giveaway for a box full of basic supplies needed for the challenges! And thanks to all who participated in last weeks challenge! I added a 2 minute brainstorming time to the challenge. They cannot touch the materials during this time, but they can make a plan. Then restart the timer and let them begin. As mentioned in my update, it is hard to get this in the time limit. So, I suggest that you see what they can do in the required time. THEN, make a mental note of what feedback you would give at that point and let them try it again. I increased the time limit slightly in this challenge, and will continue to do so until we practice a bit. The time limit is so important. I was amazed at how well my boys could throw something together in the LAST minute! When under pressure and required to think fast, they will. So, feel free to do this a few times or even later in the week to try again. Then share your experience in your post with the successive scores for each try (and photos of each attempt!). Tip of the week: Many supplies can be used over an over if they are not damaged. After your challenge is over, salvage whatever materials you can and put them in your supply box for future challenges. P.S. I will post a linky with our solution like I did this week. You are still welcome to link up to last weeks challenge all week. Heather I will post a linky with our solution like I did this week. Did you see this week's linky? So happy to hear that you are having fun with this! It is definitely showing us areas we need to work on as a family (like working together). I think it will be good for us in more ways than one. I can't get the boat instruction to print. Just FYI. Probably onmy end. It seems that printing it from the post does not work. I had to either download it, or view full screen to get it to come up. I wonder if I can remove that option if it doesn't work? We tried this week's challenge and had a lot of fun with it. Thanks for the idea! I have the flu and missed this challenge the boys were looking forward to it but I didn't feel up to going out for straws (need to keep them in stock).